Visiting the Mémorial de Caen first upon arriving in Normandy will give you a broad overview of World War II and the essential role of the region's beaches played in on fateful Tuesday, June 6, 1944. Housed in a modern, purpose-built structure on the outskirts of the charming city of Caen, the huge exhibition takes you from the build-up of World War II through the end of the Cold War. The memorial is full of objects and films made during the war and after that dramatically convey the global history of the war, including as personal stories of the soldiers. The memorial includes dioramas of the attack on Pearl Harbor and the Battle of Normandy and details the harrowing atomic destruction of Hiroshima and Nagasaki. A visit here should be the focus of the day. This comprehensive view of World War II is a lot to absorb and can leave visitors drained. Nevertheless, it's a fulfilling experience that shines a spotlight on the value of peace and the sacrifices made on Normandy's beaches. The Mémorial de Caen is located at Esplanade Général Eisenhower, 14050 Caen. The first sight as you drive into the picturesque Sainte-Mère-Église is a lifelike model of a paratrooper hanging from his flapping parachute caught on the village's centuries-old Catholic church. Private John Steele was part of the attack by the American 82nd and 101st Divisions, and the effort was ultimately a success: On the night of June 6, 1944, it became the first town liberated. The town was vital to the Allies in protecting nearby landings at Utah Beach. Discover the many details of Sainte-Mère-Église in its Musée Airborne, or Airborne Museum, located next to the church. It's unmissable, as its domed buildings are designed to look like air-filled parachutes. In front of one hall is a restored a Waco glider. A second hall houses a Douglas C-47 Dakota plane that dropped paratroopers into the Norman countryside and towed gliders. A third building houses Operation Neptune, an interactive display that transports visitors to the frenetic and momentous scenes of D-Day. There are plenty of stories to learn in Sainte-Mère-Église and the Airborne Museum, including about Private Steele. He played dead for two hours dangling in his parachute harness but was finally captured by the Germans. But he and fellow soldiers escaped; Steele found his division and rejoined the battle. Classic film buffs might recognize Sainte-Mère-Église as a backdrop in the epic ​The Longest Day. The Musée Airborne is located at 14 rue Eisenhower. 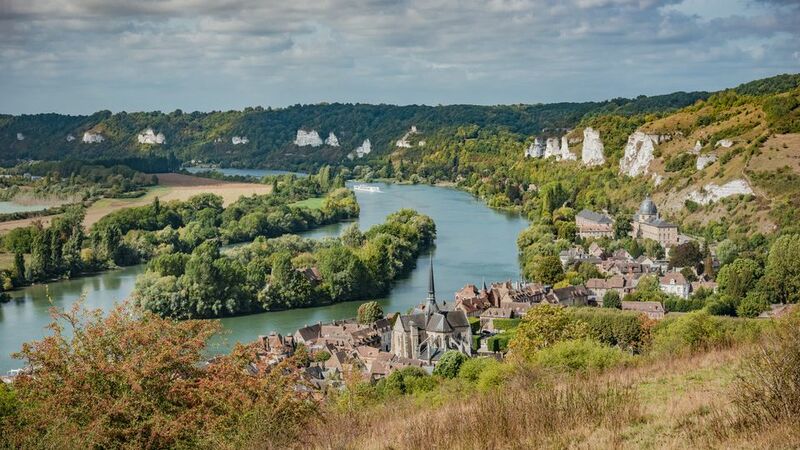 One of the best ways to explore this region of Normandy is with a comprehensive map and audio guide from the Tourist Office in Ste-Mère-Eglise. Loaded on an iPad, the virtual assistant can help you find both smaller memorial sites and also major D-Day battle sites. It’s very well done, including GPS coordinates to keep you going in the right direction along winding country roads. After a general introduction, there are 11 stops on the tour. At each waypoint, the iPad shares images of the actual battles along with commentary that tells you exactly what happened. The tour is easy to follow, and you can follow it take it at your own pace. In general, it takes between two and three hours. There's a fee to check out the iPad, and identification and a credit card deposit are required. Pick up your iPad guide at the Tourist Office, 6 rue Eisenhower. It's a name known with reverence across the world: Utah Beach. The Utah Beach Museum, or Musée du Debarquément Utah Beach, stands on the sandy dunes of a beautiful stretch of Normandy coastline. Today, it’s a popular place for windsurfing in the breeze, swimming in clear waters, and strolling along the shore. But on June 6, 1944, it was a very different scene. At 10 minutes past midnight, Lieutenant Norman Poole of the British Army's Special Air Service landed on Utah Beach, the first allied soldier to set foot on French soil. It was the start of Operation Overlord. There’s a very good mix of films and objects in the museum's collections and dioramas, including a complete briefing room illustrating the Allied invasion strategy. Perhaps the most visually impressive display is a windowed hangar-style concourse that houses a huge Martin B-26-G bomber. The museum is surrounded by monuments to soldiers, like the striking obelisk at its entrance. For a reflective view, its upper floor affords a gorgeous view of Normandy's now tranquil coastline. Find the Musée du Debarquément Utah Beach at 50480 Sainte-Marie-du-Mont. Hallowed ground, the American Military Cemetery at Colleville-sur-Mer holds 9,387 American graves. Most of the soldiers buried here were involved in the Normandy D-Day landings and the battles that followed. The cemetery is on the site of the temporary St. Laurent graveyard, which was established by the U.S. First Army on June 8, 1944. Start at the Visitor Center for an exhibition that explains Operation Overlord and the shares the life stories of some of the soldiers who fought and died in Normandy. Don’t miss the poignant film Letters, which highlights the lives of some of the young men who fought here through the words and memories of their mothers, fathers, girlfriends, and friends. The immaculately manicured cemetery itself is huge, covering 172.5 acres. To get there, walk down a path to a plaque which shows you the battle and offers a panoramic view of the sweeping sandy beach below. In the cemetery itself, perfectly aligned white headstones adorn a gentle slope that stretches into the distance, seemingly into infinity. At one end stands the Memorial with its lovely circular chapel. For all its solemn expanse, these cemetery grounds aren't the largest in this part of the world; that particular honor goes to the Meuse-Argonne Cemetery. However, with its relatively recent setting in time, it could be said to be the most moving. The American Military Cemetery is located at 14710 Colleville-sur-Mer. The Musée du Debarquément (D-Day Museum) at Arromanches explains the construction of the extraordinary Mulberry Harbors with heir temporary breakwaters, piers, and docks that allowed the Allies to take control of Normandy's heavily fortified coastline. In 1942, Churchill had sent a memo to Lord Mountbatten, Britain's Chief of Combined Operations, that the construction "must float up and down with the tide. The anchor problem must be mastered. Let me have the best solution." This museum displays how the problem was solved. A formidable task, but the best solution was an ingenious series of artificial ports built for ships filled with Allied soldiers and supplies to follow up on the first wave of amphibious and parachute attacks. The harbor was begun after the liberation of Arromanches on June 6; ships were scuttled on June 7; concrete blocks were sunk on June 8; and by June 14, cargo ships began to be unloaded. Aside from the sheer architectural difficulty of creating the artificial harbors, the Allied corps constantly contended with terrible English Channel weather that continually destroyed their hard work. The museum is quite old and small, but it's nonetheless a worthwhile stop with its excellent film on the building of the Mulberry harbors. Looking out over the long beaches, the remains of the artificial port is still visible more than seven decades after it was built. Reach the Musée du Debarquément in Arromanches at Place du 6 Juin. For an unforgettable spectacle, climb a series of steps that ascend from the middle of Arromanches to the circular cinema that rises above this small Norman town. You can also drive. Standing in the center of this engaging cinema that's build on the remains of a Mulberry harbor, a historic film illuminates nine screens that loop around you. "Normandy's 100 Days" tells the stories, complete with historical footage, of the thousands that fought—and often died—to liberate Europe. But note: It's an immersive experience, so be prepared. Visit the Arromanches 360 Circular Cinema at 4117 Arromanches. The Mémorial Pegasus commemorates the daring exploits of the British 6th Airborne Division, which was made up of more than 12,000 troops including a battalion of 600 volunteer Canadian troops, 177 French Commandos, a Belgian unit, and a Dutch brigade. They parachuted from gliders that took them silently to Normandy from England. Once there, they protected the D-Day landings from assaults by German troops. At the waterside museum on the outskirts of Caen, begin your visit with a short film of the expedition. Beyond showing the expedition, it sets a few myths straight. For instance, in The Longest Day, Lord Lovat and his bagpiper musically walk across the bridge; in fact, they ran over the bridge with bagpipes silent. The Pegasus Bridge that once spanned the Caen Canal is key display at the memorial. It was a major objective of the Allies in the invasion. There’s also am easy-to-assemble Bailey bridge, huts with different exhibitions inside, and a reconstructed Horsa glider. Mémorial Pegasus is located at Avenue du Major Howard, 14860 Ranville. Squatting along Norman coast just a few years from the churning waves of the English Channel, the Merville Gun Battery digs into the ground. Once part of the huge Atlantic Wall built by the Germans to defend Europe against Allied invasion, it was heavily fortified. Today it’s a rather eerie site, one that's both peaceful with its small town, seaside setting and also sinister with its massive wartime bunkers. When exploring the site, start outside where a Douglas C-47 Dakota is parked. Then explore bunkers to learn the history of the 9th Battalion’s assault on the battery. It came at a terrible cost: of the 750 soldiers sent on the capture mission, a mere 150 landed and only 75 survived. Be prepared for surprises, particularly the extremely loud sound and light show that happens every 20 minutes. It gives a very real—and terrifying—impression of what life was like inside a bunker under attack. Find the Merville Gun Battery at Place du 9 Battalion in Merville-Franceville. Juno Beach sits between Gold and Sword Beaches. During the D-Day invasion, all three were under the command of the 2nd British Army. Juno was liberated mainly by Canadian forces. Their fight is documented at the excellent Juno Beach Center. The museum is slightly different from the others in the region with its eye on Canada. It focuses on the Commonwealth country's background and how it entered the war. It gives you as much insight into Canada from the 1930s up to the present day as it does on the war itself. The sections on the war itself are equally well done, with interactive displays, films, and audio guides. The attack was as bloody as on the other beaches: 1,074 men landed on Juno beach and 359 were killed. After a visit, a guide takes you to the beach and the bunker in front of the museum, explaining the Atlantic Wall and the battles of the June landings. It's a reflective opportunity to remember the 18,000 Canadian casualties of the invasion of Normandy, of whom 5,500 died. Visit the Juno Beach Center at Voie des Francais Libres, 14470 Courseulles-sur-Mer.